Today I'm sharing a gorgeous vintage buffet that I painted for a client. 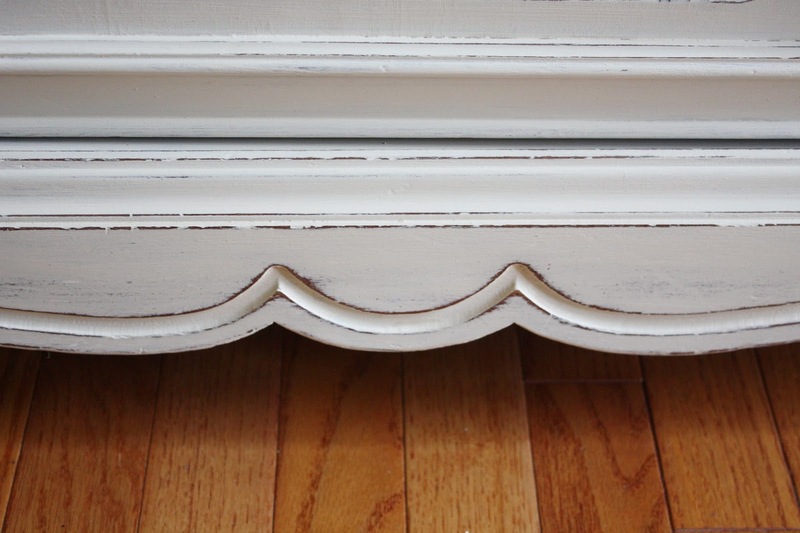 This is the first of two pieces; the second is a companion china cabinet which I will share photos of soon. 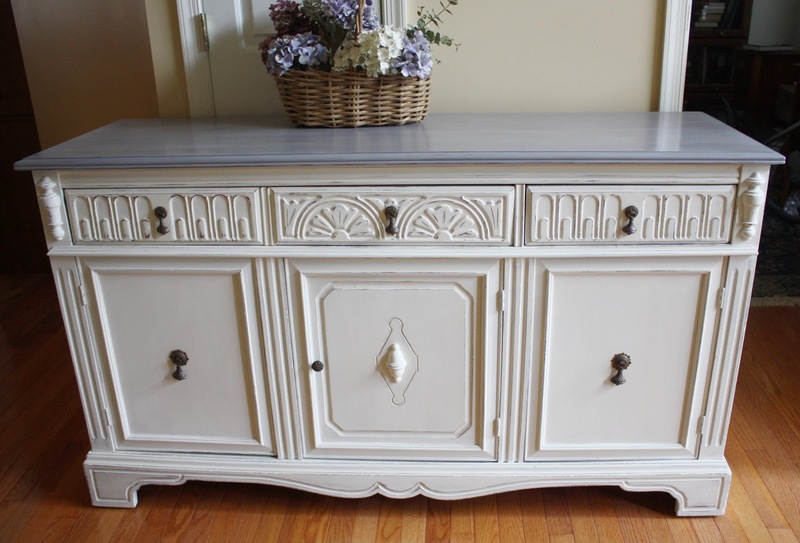 The buffet was in good condition, but my client wanted a lighter and brighter look. 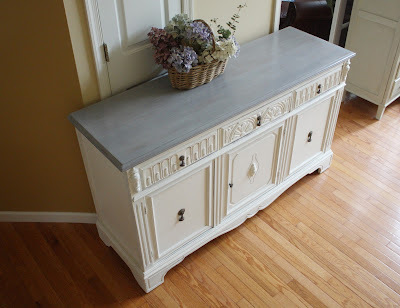 The color scheme she choose was Old White with a Paris Grey top (Annie Sloan Chalk Paint). There were a few twists and turns before we arrived at the finished piece, but in the end I think it turned out lovely. I was excited to get started on the project and almost forgot to take a "before" photo. Fortunately I remembered just as I was getting started. 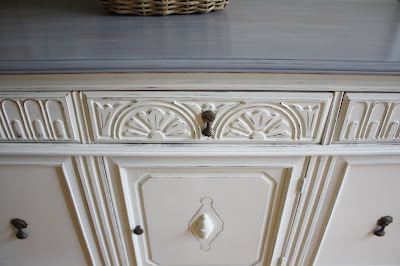 The drawers had interesting carved details on the fronts. 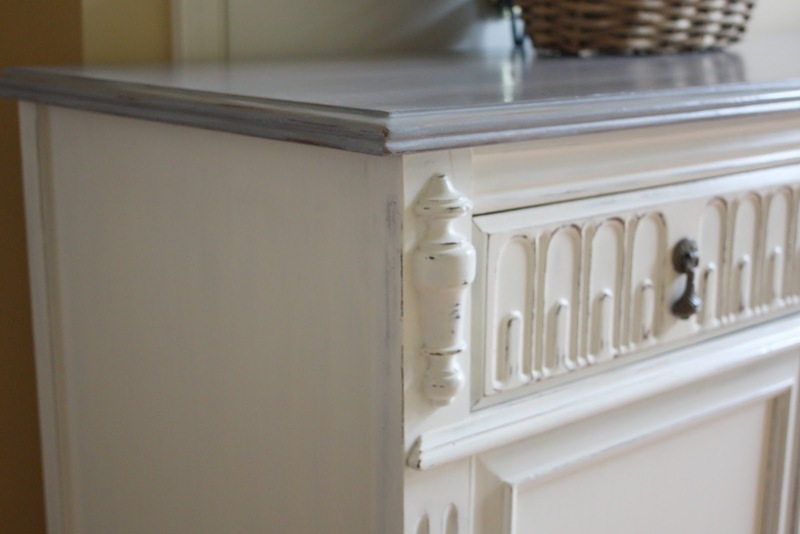 There were some indentations in the wood from the hardware which I filled in as my client was considering changing the hardware in the future. She wanted heavier distressing on the finished piece. 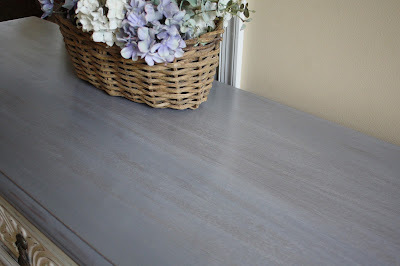 This photo was taken while I was in the process of sanding and shows one drawer with distressing and the other without. 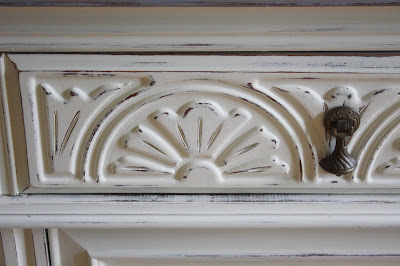 I think it's a good example of how the distressing brings out the details. Distressing (on left) brings out the details of the carvings. 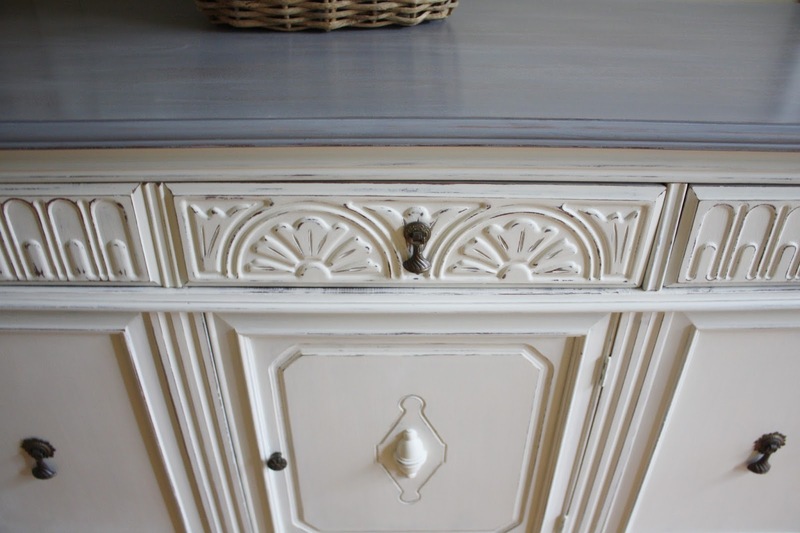 I painted the top in Paris Grey, but was concerned the shade was too light based on a previous conversation with my client. 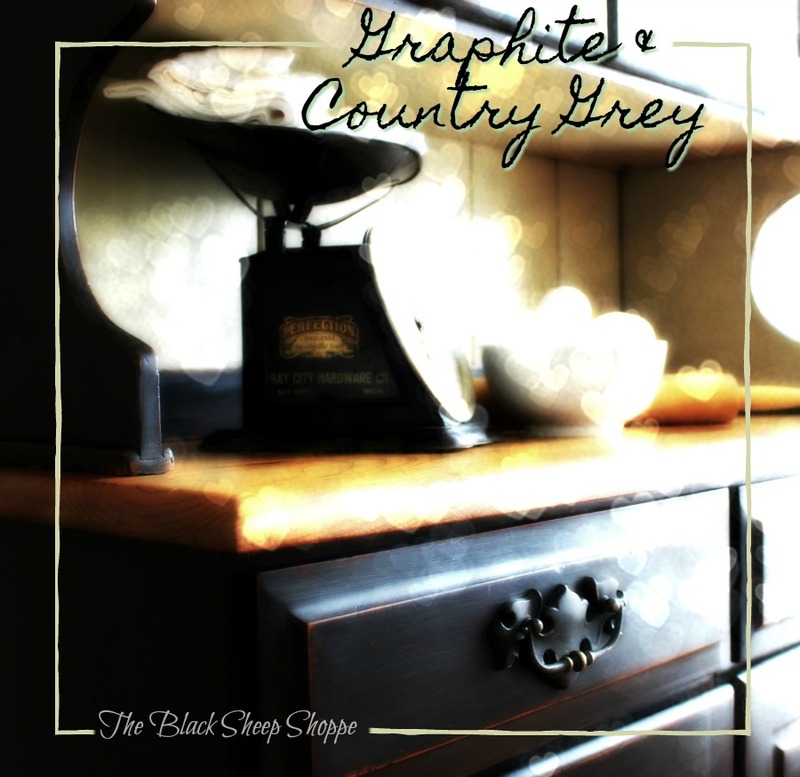 So after some photo exchanges we were able to land on a custom mixed grey a few shades darker. The plan at this point was to paint the top in the darker grey, allow some of the lighter grey to show through, and then add some dry brushed highlights in white. in the corner compared to the original Paris Grey. 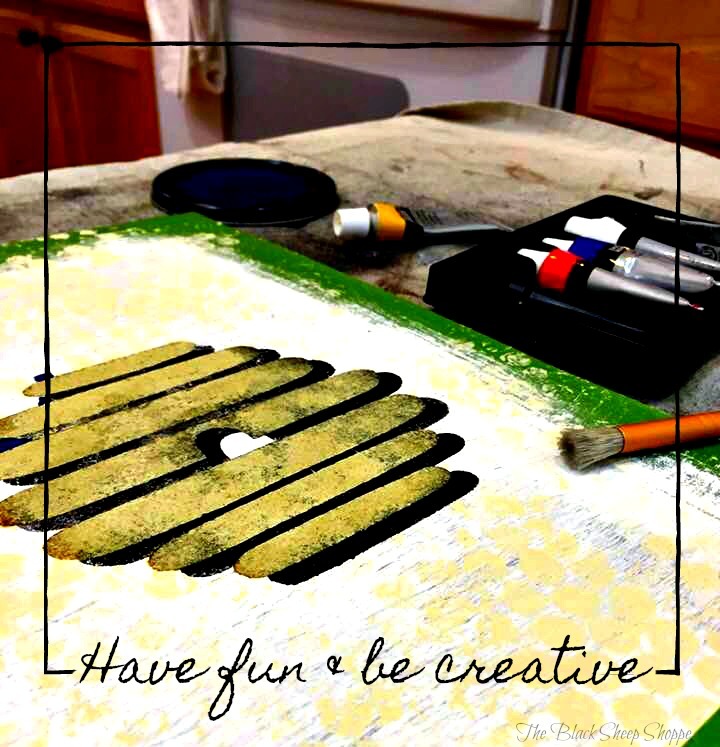 Although we planned for the lighter shade of grey show through the darker shade, I decided to sand off the initial base color and add highlights later as this would give me more control. After I sanded off the original finish I noticed how beautiful the wood grain was. I sent a photo to my client at this point in case she wanted to leave the wood top unpainted. 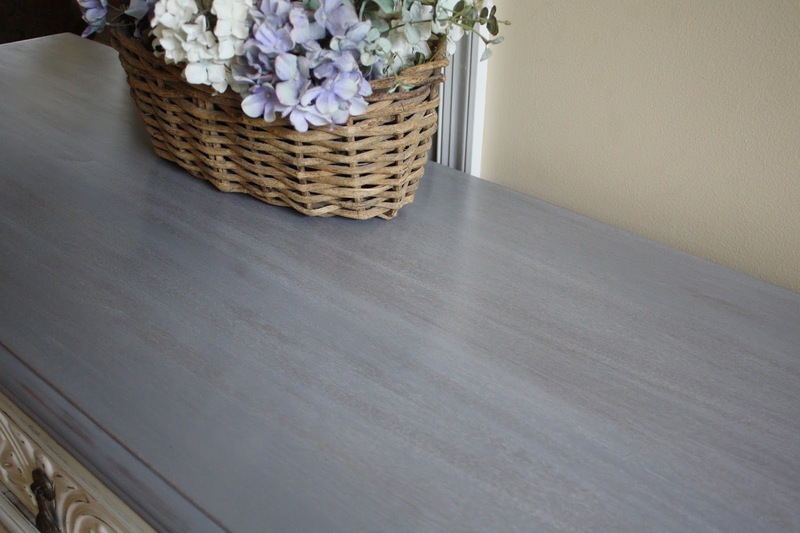 She agreed the wood was lovely and decided to go with a translucent finish in the darker grey while still leaving some of the grain peeking through. I think my client made a good choice of color scheme and the buffet is now totally transformed. I put the original hardware back on, but it's ready for new pulls if she decides to switch them out in the future. The top is as smooth as silk and the translucent grey is lovely. 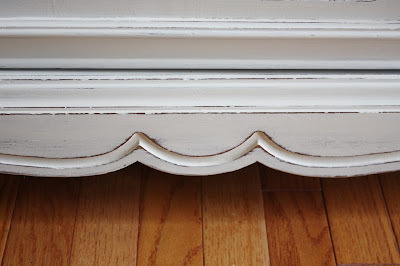 My favorite part of the buffet is the carved details on the drawers. 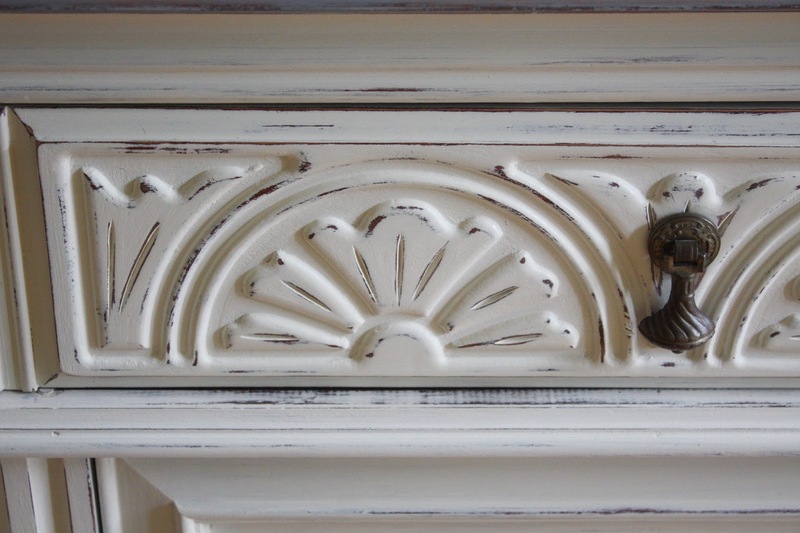 The distressing highlights the details and adds to the vintage charm. This was a fun project for sure and I hope my client enjoys her new buffet for many years to come.